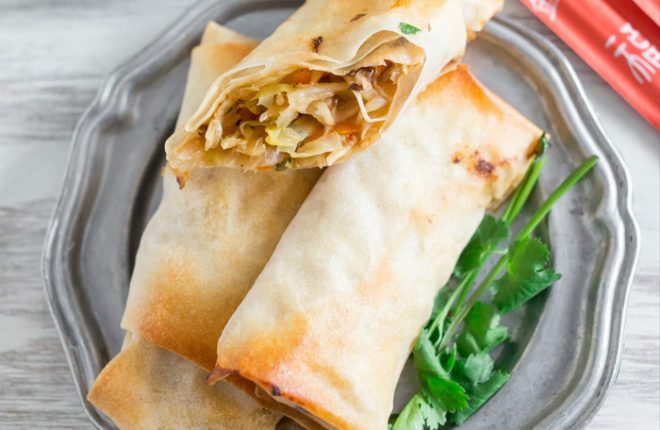 These veggie-packed egg rolls crisp up perfectly in the oven – no deep frying necessary. Just add chicken for the omnivores – easily made vegan too! Note from Kare: Brandy from Nutmeg Nanny is back with a tasty and adaptable recipe that, frankly, makes a terrific dinner in and of itself. But if you want to give it the appetizer treatment, I don’t think anyone will complain! 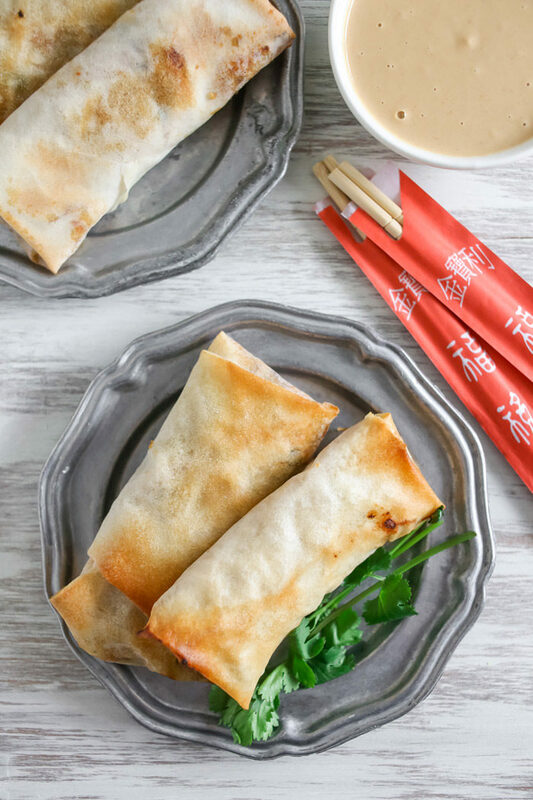 I adore these crispy baked vegetable egg rolls – no deep frying in sight. Take it away, Brandy! I’m a serious egg roll lover. I’m not even exaggerating when I say that. 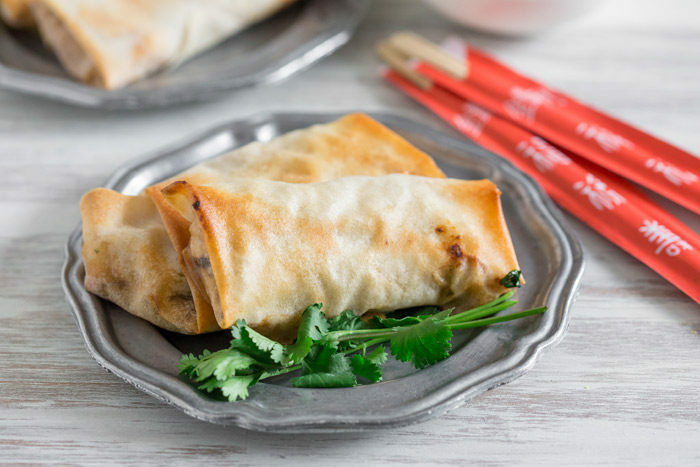 Sometimes when we order Chinese food, I think to myself: “Would it make me too much of a pig if I just ordered three egg rolls and nothing else?” I have yet to give into my desire to just feast on egg rolls but I’m really only one bad day away from probably letting it happen. 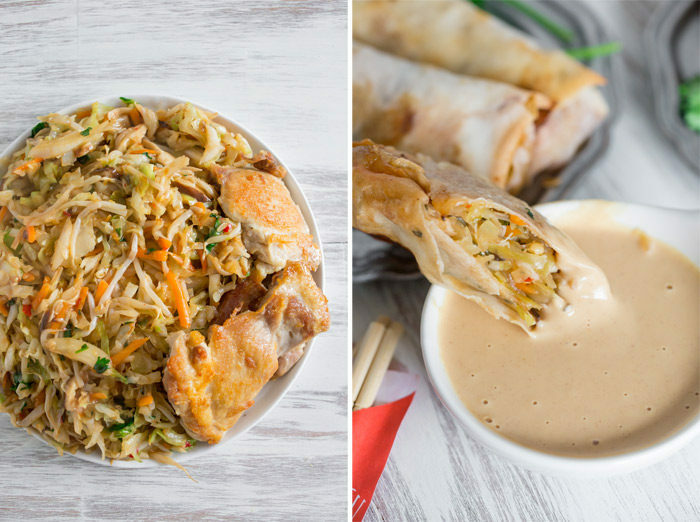 Homemade egg rolls are great because you get to throw in all the vegetables (and meat) of your choosing. For this recipe I did a mix of cabbage, carrot, bean sprouts and shiitake mushrooms. I also made a version with added chicken because I’m all about the protein addition. However, I did have two issues when making this recipe. Problem 1: I had to drive around to all the grocery stores in the area before I found egg roll wrappers. Even then, all I found was spring roll wrappers. Which in the end are similar enough, but they are a bit thinner – so that means they come out a bit crispier. Problem 2: I’m the worst egg roll wrapper EVER! I’m not really sure why I’m so bad at this but I just can’t get them all to be the perfect size. In the end it’s really not a big deal since it’s just my family eating them BUT I guess if I were looking to win a gold medal for a egg roll wrapping I would not win. I’m not even sure I would place. Oh and back to problem number 1, guess where I finally found the wrappers – the Asian market. Duh. Why didn’t I just go there in the first place? I’ll never know. However, most large grocery store chains do in fact carry egg roll wrappers. Mine were just all out on the day I needed them. Apparently everyone wants to make egg rolls. Which makes sense they are in fact delicious. As far as dipping goes you can really make up any sauce that you like with egg rolls but I opted to make a peanut butter based sauce. I think the savory peanut lime flavor goes perfectly with all the vegetables stuffed into these babies. PLUS it’s just another excuse to eat peanut butter, which is always a plus in my book. Preheat oven to 425 degrees and line a baking sheet with a silpat liner or parchment paper. Set a very large non-stick skillet over medium-high heat. Add 1 tablespoon olive oil. When hot, add mushrooms and cook just until they start to soften, about 3 minutes. Add the cabbage, bean sprouts, ginger, and chili garlic sauce. Cook just until the cabbage starts to soften and cook down slightly, about 3 more minutes. Stir in the soy sauce and turn off the heat. In a small bowl, whisk together cornstarch and cold water. Add into the skillet and stir. Keep stirring until the mixture thickens, about 1 minute. Stir in cilantro. (Add chicken now if using). Fill your wrappers! Have a small bowl of cold water at the ready and then do the following: Lay your wrapper in a diamond shape. Add 2-3 tablespoons of filling to the middle of the wrapper. Fold the bottom up around the filling and snugly tuck it in. Dip your finger the water and moisten the remaining three corners of the wrapper. Fold in the left and right corners then roll up the egg roll and secure the top. The water on the wrapper is what keeps it closed. Lay the wrapped eggroll seem side down onto your prepared baking sheet. When all your egg rolls are wrapped, brush with the remaining tablespoon of olive oil (you can also spray them with olive oil spray). Bake, flipping once halfway through, until golden brown, 15-20 minutes. Serve with dipping sauce. Add all ingredients to a small bowl and whisk together. If the sauce is too thick, simply thin out with more. Use 14 ounces shredded cabbage-and-carrot cole slaw mix. Less prep! To add chicken to all, stir in 1 cup chopped cooked chicken to filling after it’s cooked. To add chicken to half, transfer just over 1/2 of the cooked veggie mix to a bowl. Stir in 1/2 cup cooked chopped chicken to the remaining filling. 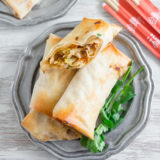 Assemble egg rolls separately and keep them segregated so you can tell which egg rolls are the meaty ones and which ones aren’t! Swap out the honey in the dipping sauce for pure maple syrup or agave syrup. 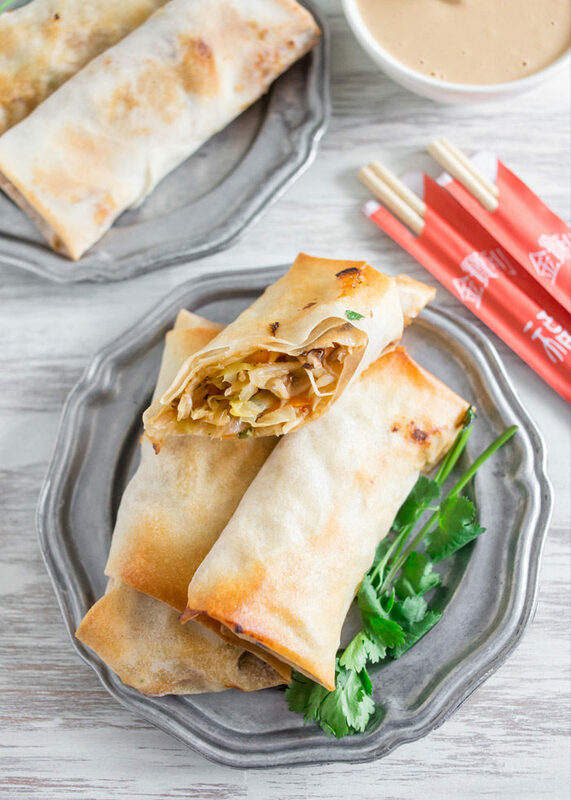 Also, some egg roll wrappers may contain egg, so check the ingredients or opt for spring roll wrappers instead.